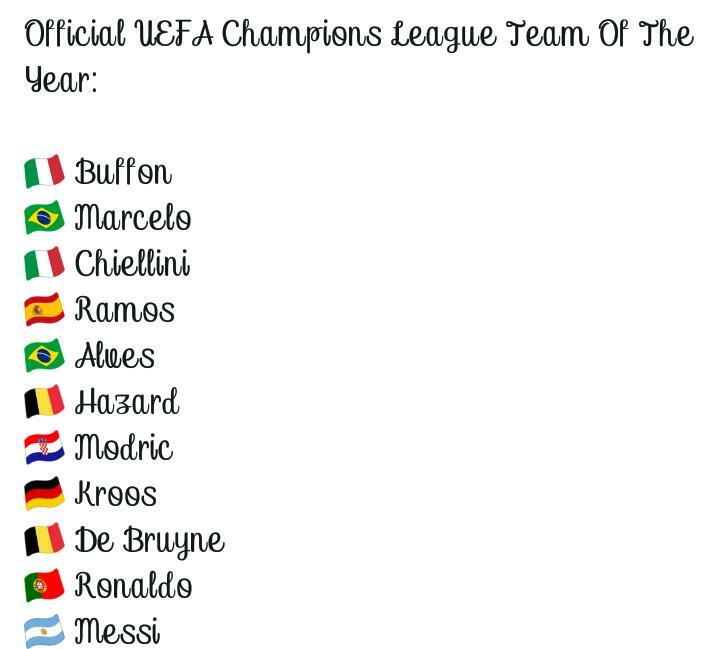 Players of European Champions Real Madrid deservedly dominated the UEFA Team of the Year after it was released on Thursday afternoon. Real Madrid made the history books after they became the first team to retain the UCL last year following their 4-1 thrashing of Italian champions Juventus in last season’s final. Portuguese superstar Cristiano Ronaldo scored twice in that final and he leads the other Real Madrid players in the UEFA Team of the Year released. Other Los Merengues like Marcelo, Sergio Ramos, Luka Modric and Toni Kroos also made the list. They are joined on the list by Gianlugi Buffon and Giorgio Chiellini (Juventus), Daniel Alves (Paris Saint Germain), Eden Hazard (Chelsea), Kevin De Bruyne (Manchester City) and Barcelona wizard Lionel Messi.